This walk has a diverse landscape that has something for everyone. Woodland, coast and beach, freshwater marsh and Sandlings Heath which is a delight to any visitor and worthy of its status as an Area of Outstanding Natural Beauty. The walk heads out of Leiston alongside the man-made Aldhurst Farm nature reserve, an area of wetland, heath and grassland created in 2015 as a sweetener for the local folk should the proposed Sizewell C Power Station get approval. It isn't presently accessible to the public other than the established footpath that runs along the valley and a new path running adjacent to Valley Road. 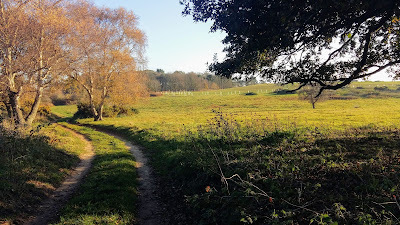 The north side of the reserve was once known as Winters Heath, common land that was enclosed in the early 19th century. Therefore this is not so much as giving something to the community as returning the access rights to the people that such common land once afforded. Moving on up to the top of the hill on Lovers Lane where we take the track off to the right as the road bends around to the left. An interesting feature on the OS maps at this location is an area marked as Fiscal Policy. This is thought to be a so called Trap Street, a fictitious location that is used as a copyright marker for the cartographers work. This specific fictitious location has been added to OS maps since the 1920s and has varied its exact location over the decades, although keeping within the general area of the western side of Kenton Hills. It is certainly not a location known to locals and appears on no other maps of the area other than the Ordnance Survey. It is notable that there are many references to the area of Fiscal Policy made in modern documentation written by both Suffolk Council and EDF, the Power Station operators. This goes to show the lack of local knowledge these bureaucrats and business managers have which may account for their scant respect for the surrounding landscape. The route then heads through a car park and into the woodland through the areas known as Kenton (marked as Tenton on 19th century OS maps) and Goose Hills. The naming of the area as Hills is not self evident from the tree covered landscape. It has to be said that there is a triangulation station in the depths of Goose Hill but this is only at an altitude of 9m with the surrounding landscape no less than 5m. I guess a mere 4m high piece of land surrounded by marsh may look like a hill but it certainly is not self evident within the dense forest. The names of Kenton Hill and Goose Hill date back from long before the forest was planted, when the area was Sandlings heathland. It wasn't until the 1960s, with the coming of Sizewell Nuclear Power Station, that the heath was planted with a managed forest. Going back further in history the area is thought to have been parkland attached with the 14th century Leiston Abbey, some documents describing it as a deer park. There are many tracks through the woods including a section of the The Sandlings long distance trail as well as specific colour coded way-marked trails. This particular route takes the unmarked perimeter paths out to the extremities of Goose Hill where there are views onto the marshes to the south of Minsmere and a purpose built hide for those who want to spend some time discovering the wildlife of the marsh. Whatever route one takes, navigating to the eastern edge one will find two footbridges which provide access across to the coastal section of this walk. Sizewell beach offers both coastal heath and a shingle beach to walk along. The northern section at the point where the path emerges from the woods, was once a 19th century rifle range which I believe was also used during WWI as target practice for the troops. The beach and heath paths pass in the front of the two power stations at Sizewell and is a very popular for both tourists and locals walking through to Minsmere Sluice and beyond. For those wanting refreshments there is the Vulcan Arms pub at Sizewell as well as the Sizewell T cafe although this is closed over the winter months. Return uses the medieval track through to Broom Covert. This was the original route between Leiston and Sizewell before the modern road was introduced in the 19th century. Broom Covert is an area of ancient Sandlings heath that is a delight to walk through and is another highlight of this walk, its contoured grassland hinting at hidden earthworks that may lie beneath. It is thought that this area was extensively used for troop training during WWII and there may be hidden structures dating from this period lying beneath the surface. A permissive path leads across the meadow at Round Covert to Reckham Pits Wood which was originally part of Leiston Common, the woodland growing up in the early 20th century after it had been used for aggregate excavation. The mixed woodland is a much wilder landscape than that of Kenton Hills, with a cacophony of trees, foliage and fauna all competing for space, a blaze of colour and light in all seasons. 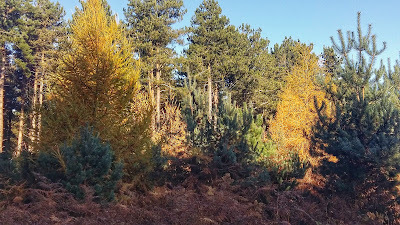 Above the woodland is what is left of Leiston Common, correctly known as Leiston Dry Common to distinguish it from Leiston Wet Common which once occupied part of the marshes. The Common features in many local tales and stories of 18th century smugglers who would stash their booty in holes dug into the sandy soils of the common. 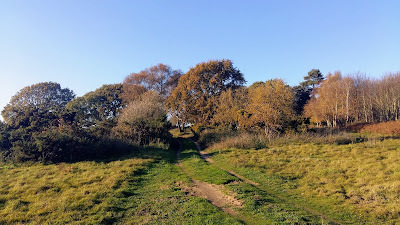 There is a permissive path on the north side of the common that leads down to the marsh known as Sizewell Belts and across to Kenton Hill woods. The public footpath leads out onto Lovers Lane with a new footpath adjacent to Valley Road to take the walker back into Leiston. It has to be stated that much of the landscape this route passes through may disappear in the next decade due to industrial usage despite its status as an Area of Outstanding Natural Beauty. The proposed Sizewell C power station will claim some of the woodland, specifically much of Goose Hill which will be replaced by an access road to the construction site and a railhead. The route of the proposed railway will run adjacent to Kenton Hills and may well devastate the fictitious area known as Fiscal Policy!. No doubt Goose Hill will be flattened with the introduction of the road, its trig point no longer applicable with the tallest structures becoming the 20-30m high spoil heaps which will dominate the landscape to the north west. Public access to the woodland may become limited with probably no access through to the beach. The coastal access will be restricted during the construction of a loading jetty and sea defences, and the coast path may be blocked up for the duration of the build depending upon the design of the pier head that is chosen. The long distance routes of the Coast Path and the Sandlings Path will get diverted along Lovers lane and then taking the roads through to Eastbridge, a lengthy diversion along asphalt which is not conducive to committed walkers and hikers. There will no doubt be contention between road users and pedestrians, such confrontations already occur when walking the local roads so this will only get worse with the increased traffic. This re-routing is a big concern as many walkers make use of the coastal section from Sizewell through to Minsmere which makes the local area an attraction for outside visitors who may well be put off by such unpleasant walking diversions. On the southern side of the route, Broom Covert is set to be requisitioned for the construction of Proposed East Anglia One/Two Windfarm Substations which will dominate the area, its buildings being some 18m in height. There is much opposition to this, the land being a prime example of Sandlings Heath and deserving of its Area of Outstanding Natural Beauty status. It seems outrageous that such areas can be claimed by industry without any opposition from the public bodies that are there to protect such land. It is uncertain whether access rights will be retained once this construction starts with the only alternative being to walk the roadside pavements down to Sizewell, certainly no substitute for the delights of the Broom Covert route. It does appear that the Sizewell Belts area may be left intact although the permissive paths across the marsh into Kenton Hills may be blocked up. This may well also be the case for the permissive paths around Reckham Pits Wood although it is thought Leiston Common will still be accessible. As of 4th December 2018 ScottishPower Renewables (SPR), with the conclusion of the Phase 3.5 Consultation for the proposed East Anglia TWO and East Anglia ONE North offshore windfarms, has decided to opt for the substations to be placed at Grove Wood, Friston rather than the threatened Broom Covert. Although this is a reprive for an Area of Outstanding Natural Beauty, it has to be said that the Friston location borders on the old heathland of Friston Moor. This is a walk summary intended to provide the user with just the essential information in order to navigate the walk route. Fully detailed information notes, refreshment stops and walk features are not included in this. A full write up will be included in the near future.